The TOP 10 3D Printing Files (STL) Of The Year! Every year 3Dnatives reveals the best 3D models you can find and easily download! This January, we compiled a list of the ten best 3D printing files you can easily get your hands on. This ranking has been put together with the files available on Cults. If you have a 3D printer at home, we’ve included the link to the STL file at the end of each description! This handy little object was realised by the maker Barbe Iturique who won the contest “The 3D Printed Kitchen” organised by Cults in collaboration with the company Machines-3D. 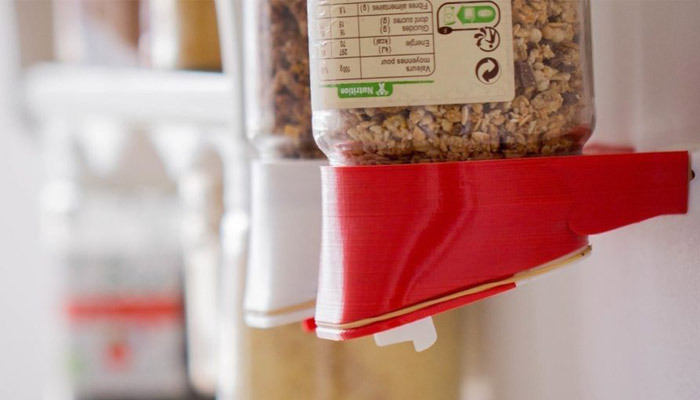 It’s a 3D printed distributor for the kitchen that allows to serve as many things as possible. You just need to attach it to a glass jar and you can serve coffee, loose tea, cereals, sugar, rice, etc. The flap is printed in PLA for food contact. This formidable piece, realised by the artist Snorri is an homage to the 1902 film from George Méliès “A Trip to the Moon”. The rocket in the eye of the moon is the most iconic image of his work. Snorri happens to be the great great grandson of George Méliès! If you’re a fan of cinema, go ahead. The end of last year was marked by the death of Stan Lee. A man to whom we owe many superheroes such as Hulk, Spider-Man, The Avengers, etc. 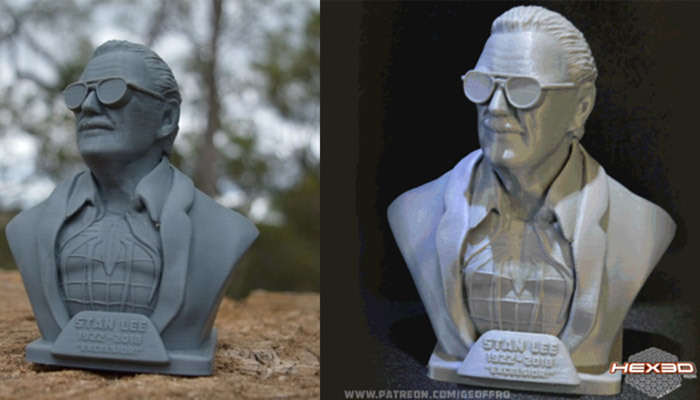 His characters have often been modelled and 3D printed around the world. Naturally, the whole maker community wanted to give him an homage. The following 3D model was particularly appreciated. It’s the work of the designer Geoffro. We can see the bust of Stan Lee with a Spider-Man costume and his usual glasses. A beautiful memorial. 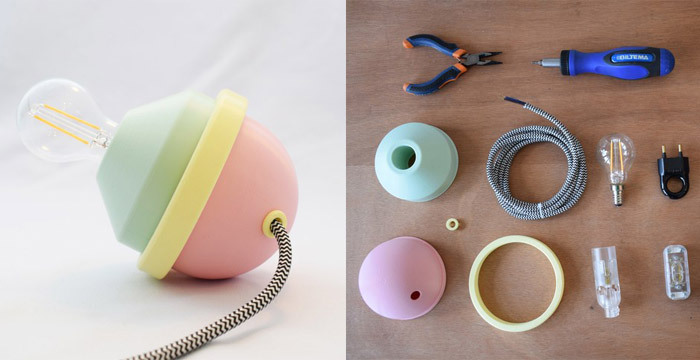 This small lamp was realised by the French designer ClemGerm (Clémence Germain). It happens to be a quirky and practical tumble lamp which you can orientate as you wish. This design was inspired by the Memphis movement in the 80s. In addition, you can easily DIY this object once the parts have been 3D printed. It’s quite easy and the design is amazing! Conceptualised and fabricated in France, this cat (or small dog) house is a piece designed by the brand Catalpine. Indeed, it’s been conceived to offer pets a comfortable and cozy home. In addition, it’s very beautiful piece if you are into home design as it adds a modern and sleek element to a room. 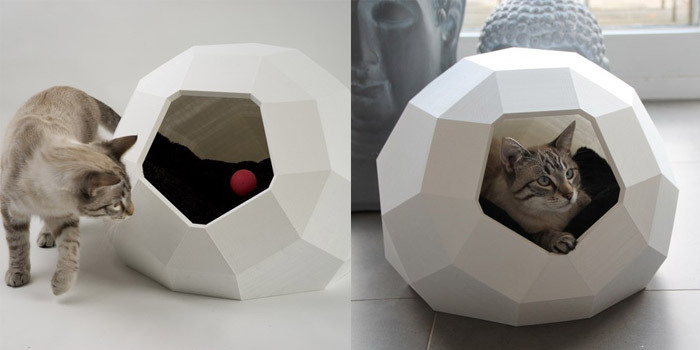 This cat house can be 3D printed in one go on a large volume 3D printer. Otherwise, it will have to be divided into smaller pieces and print it in two times before assembling it. The year 2018 was also marked by the centenary of World War I. 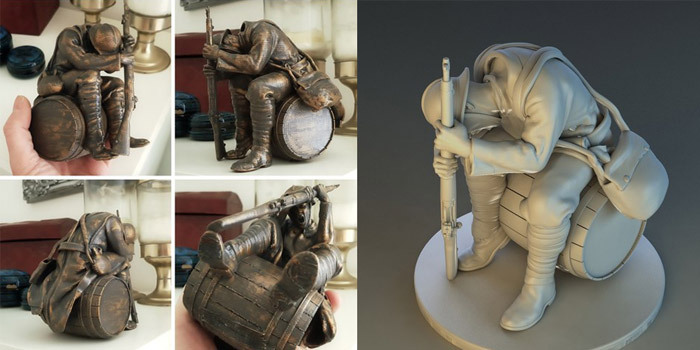 As a memorial to the soldiers who fought and perished in this war, the designer Alphonse Marcel brilliantly modelled and 3D printed a screaming soldier. 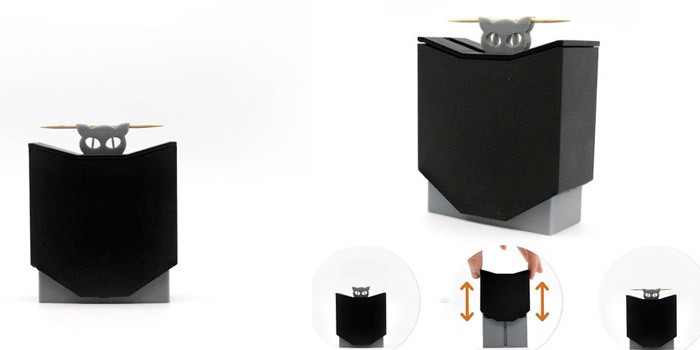 Created by FFMicka from 3D-Pocket, this small object magically supplies toothpicks through the small head of a malicious cat. A very original gift idea, you only have to move the lid up and down and the magic happens. This system is very ingenious and fun, perfect on the table when having nibbles with friends. Only thing to keep in mind is that you’ll need a high-performance 3D printer for this piece. 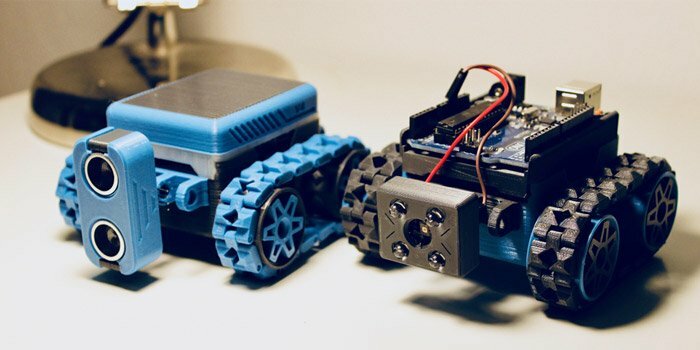 SMARS, an acronym of Screwless/Screwed Modular Assemblage Robotic System, is a simple robot designed for the educational field by the engineer Tuitxy. 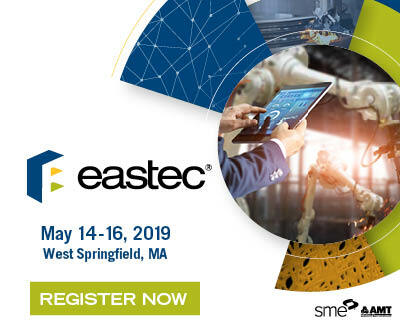 The main features of SMARS are the reduced number of components, the possibility of mounting it without screws and without soldering any parts, nor do you need glue. Another important feature is the modular design of SMARS. You can mount different sensors and tools, as well as design your own parts. Not the most useful object, nevertheless a very hypnotic one! This sculpture was realised by Cisardom from Prusa Research. 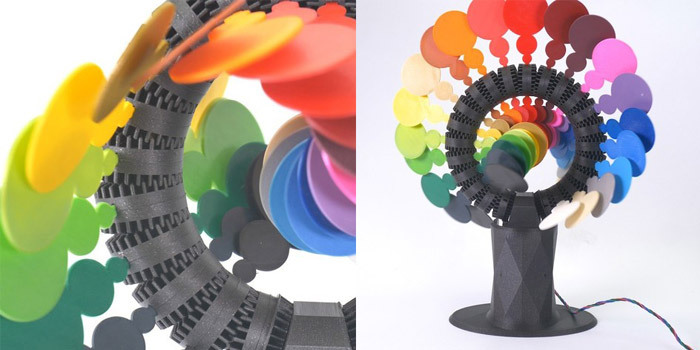 Its mesmerising movement showcases the colours of a rainbow going round in circles. The movement is extremely smooth and is ensured by just one motor. Additionally, the whole assembly is very easy. Many makers have already reproduced this piece! This power robot presents great design as it can be printed without support and is articulated! It has been created by the designer, Reza Aulia. 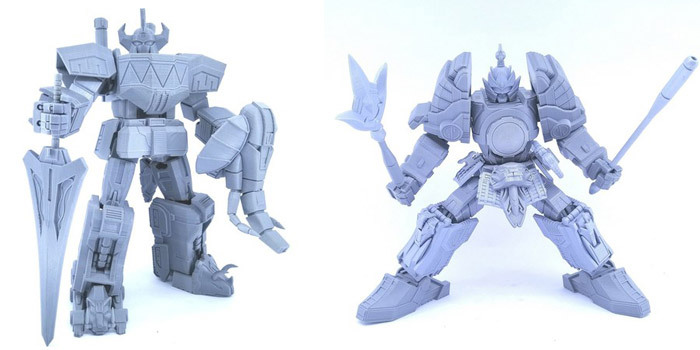 These are samurai robots, one comes with a sword and the other an ax and a bat. This creation is directly inspired by the Megazord Power Rangers. If you have children, or yourself enjoy Power Rangers, go ahead! If you’re looking for more inspiration, you can check out the list of the best 3D print files from Cults! You can always check out the list we made last year as well! Which were your favourite 3D printed objects of 2018? Let us know in a comment below or on our Facebook and Twitter pages! And remember to sign up for our free weekly Newsletter, to get all the latest news in 3D printing send straight to your inbox!